Saturday was a fall clean up day here at our place. Rich and the older boys did most of the work outside, while I did the inside work and Grace helped with the little ones. Dave and Caleb wandered around, not needing to be watched over. So they were the ones that found the salamanders. I love the picture of Davy’s hand and mine, with this small and sticky creature. The children all like to show me their discoveries because they know how much I enjoy admiring them. 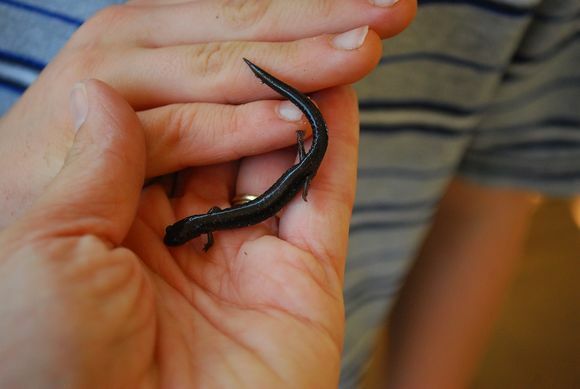 It was the Day of the Salamander…we typically never see them! But on Saturday they joyfully found them underneath rocks all over the place. Grace came back from the woods with her small brother Seth. 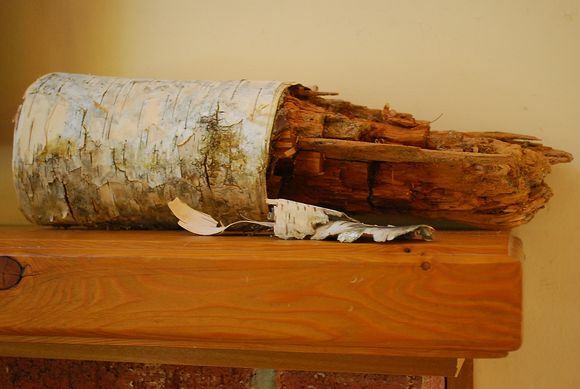 They had gone for a walk and brought me home a half decomposed white birch log and some bark, now sitting on the mantel. When I came back home from picking up pizza for our picnic lunch, I found Jacob with the camera. 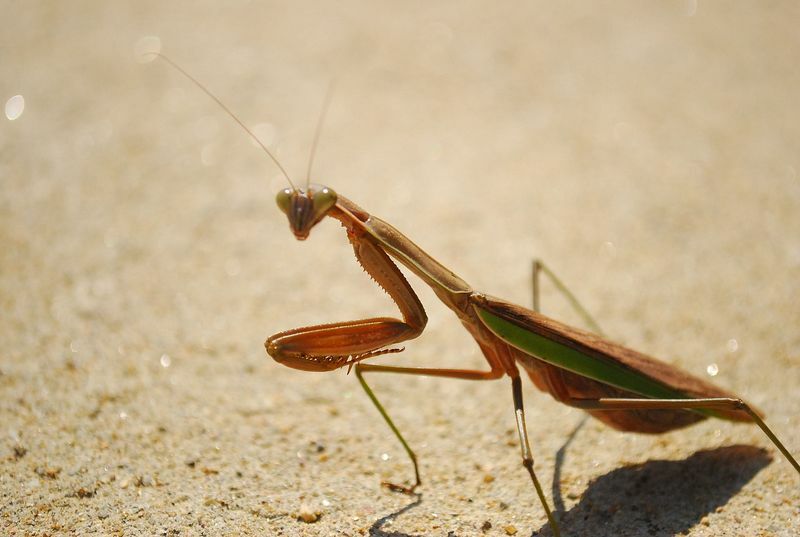 He had taken a bunch of pictures of a preying mantis that he found near the garage as he was mowing. He was able to locate it again to show me and we watched it for a little while. It was most fascinating to observe the long legs that could fold up so nicely, or reach out to grab at grasses and climb. And if all the happy nature finds weren’t enough, I also discovered a box in the mail that day from my dearest friend. 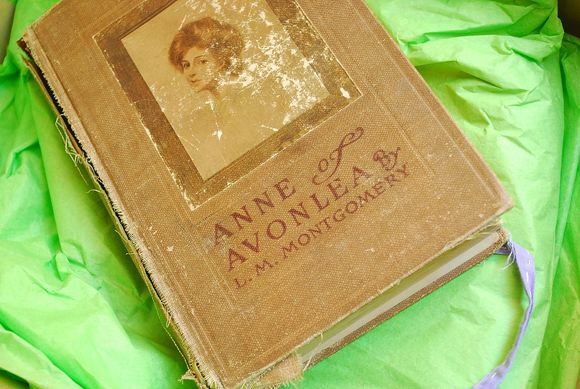 Inside, among other things, was a vintage copy of Anne of Avonlea. Be still my heart. I spent some time later that day ransacking all my books, trying to locate my Anne of Green Gables copy and YES I found it. An old lady from church gave it to me when I was, as a teenager, helping her clean her house. We opened a box of books and found it right on top. When she saw me gasp and hold it to my “bosom” (as Anne would say), she AMAZINGLY GAVE it to me. I treasure it. It is so fitting that Joanna gave me the next book in the series. I will dearly treasure both these books, always. I made a new cake recipe for company Saturday night. 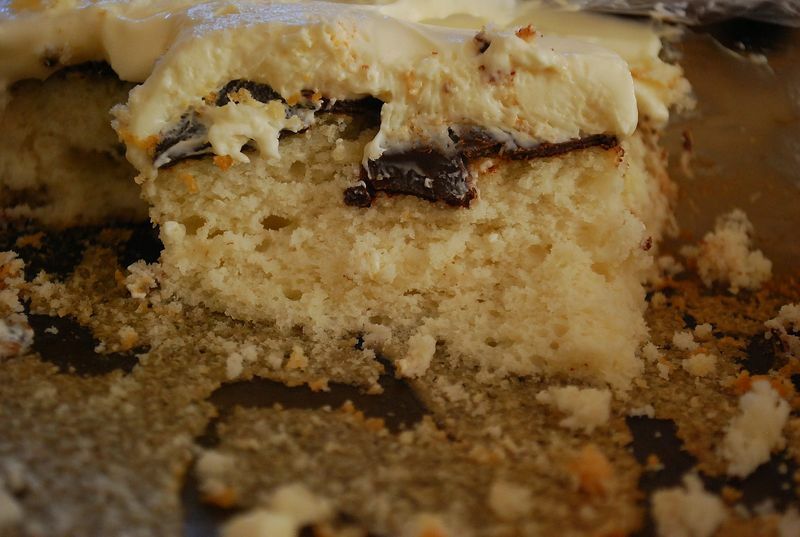 White chocolate and **mind the fudge filling between the cake and white chocolate whipped cream frosting**! I am thankful the children ate it so fast…I only had one piece but that was all I needed. Grace and I went to a used furniture store downtown and I found these sweet little towels, handmade with bright fabric and trimmed in ric rac and crocheted lace. Only 2 dollars each. They remind me of something I would find at anthropologie but the price there would be $$ too much. 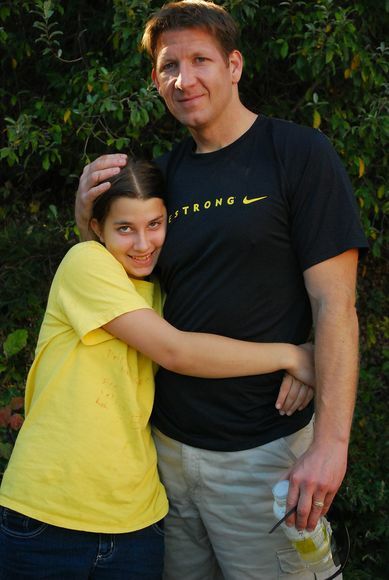 Rich and his Gracie-girl. 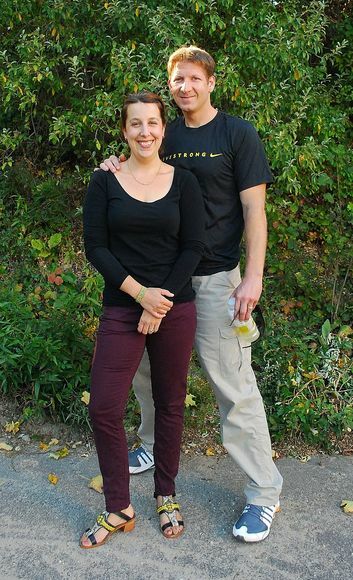 He had just rode his bike for 25 miles and the two of us were about to go on our Sunday afternoon date. PS. He has a stress fracture in his foot and cannot run until it is healed. No marathon for him this fall, but at least he can ride his bike. Rich and I before we left; I had a delicious blue cheese and steak salad on our date. I need input on this cabinet. I bought it at the aforesaid furniture store. 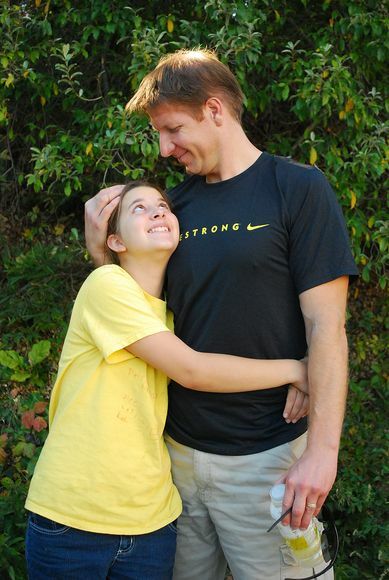 Rich promptly proclaimed it “crappity crap” (not his term, but mine, via Dottie Angel) but yours truly loves it. I love old things that smell like something that came out of an old lady’s house. Well, within reason, of course. We used to have a corner entertainment stand with our old TV in it and could shut everything up out of sight. But recently, Rich updated our TV and bought a flat screen. *Gasp* He hung it over the fireplace (I’m still *gasping over the unsightliness*), but thankfully I found the prefect cabinet to hide the TV (not ordered yet) but *what to do about the VCR and all the tapes*?? I thought this cabinet would do the trick. It’s nice and heavy but obviously painted and repainted to it’s current fabulous white state. The inside is light orange and has three shelves. The doors open and shut sort of stiffly but do work just fine. I yelled “I LOVE MY LIFE” twice yesterday as I settled into my lawn chair with a quilt, book, and coffee. Several children looked on, amused. I had a hot caramel apple cider at Starbucks yesterday for the first time. Oh yes. Jacob stayed up watching his football team lose last night and is not looking forward to being taunted at school today. David will be starting clarinet lessons soon. Sarah is my baby, I love her. I finished my book; it was hauntingly beautiful. I have spent all morning trying to find The Bad Smell. Sarah found it; a little pile of poo in the corner. I will be going to the store this morning. We are out of milk and cereal. Dave hated his bowl of “morning mix” (all ends of cereal boxes that I save in one big storage container). Even though the house is clean there is still laundry to do. I will hang it on the line to dry. It now smells of glorious fall out there. Bliss. I thank God for this day. Thanks for stopping by! You always give me inspiration! I loved reading this post! I do have a question, where did you find a cabinet for your TV and is it just one that incases the TV only? I am in the same dilema LOL , we are getting a flat screen that wont fit in our beautiful TV cabinet that we’ve had for years! 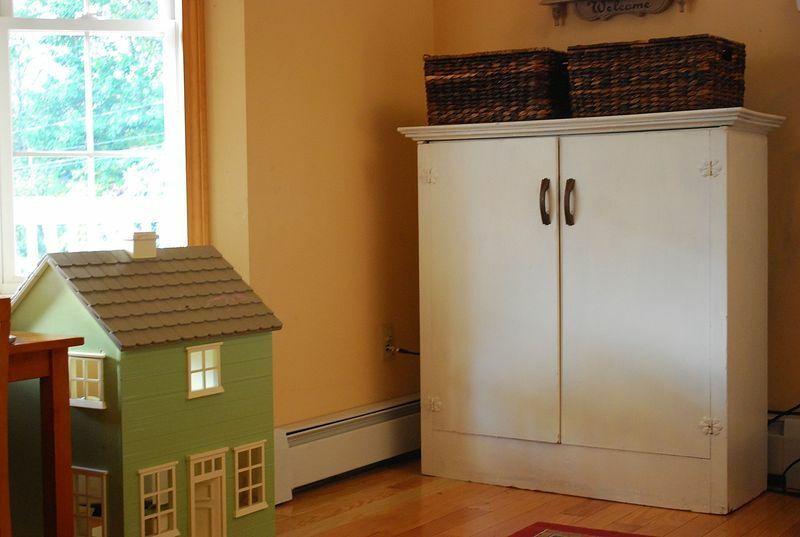 I can’t seem to find a cabinet that will hide TV and store all the DVD’s and video’s we still have and intend to keep for the little ones. Anyway….. I love you! Just had to say that. You and Rich are so right together! I don’t know what the wood is on the cabinet, if it can be refinished? 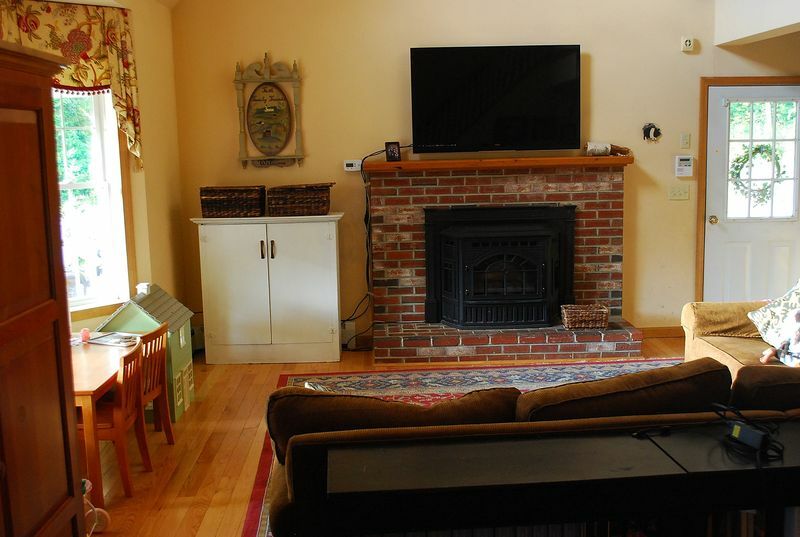 If so, a warm wood color to match the mantle, floor, furniture would be nice. Otherwise it could be painted, which would probably be easier. You could do yellow, like the walls with a trim on the top piece of green or burgundy (pick up a color from the drapes or rug), or do the whole cabinet one of those colors or the rich maple like color to match other wood (I am sure you have seen the look in your country living mags). Anyway, that would make it look much nicer than the stark white. I enjoyed the critters too, and those books! 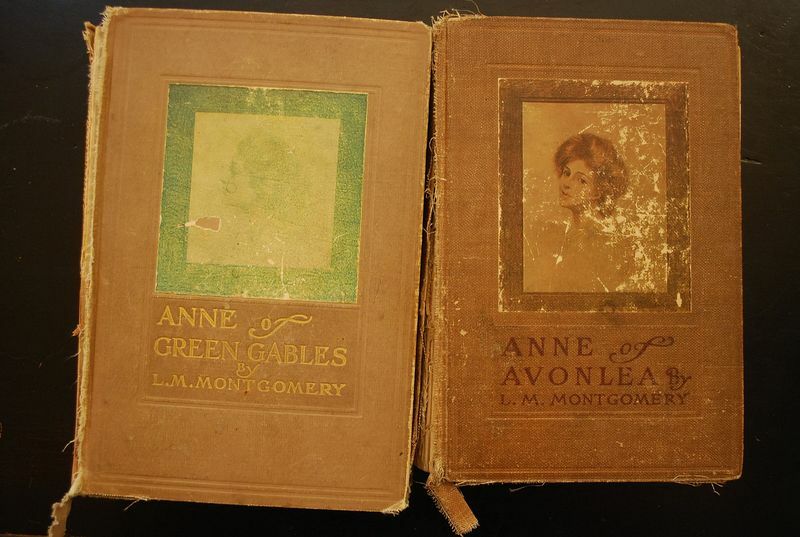 Oh my, I like old books so much,and to have them “Anne books”, even better! Beautiful salamanders (we’ve seen many this year too), beautiful Anne books, beautiful towels and cake. The cabinet…sorry, I agree with Rich. Hope his foot heals quickly!! Maybe new handles and cool old looking hinges like those you might find on an old trunk? I don’t think it’s terrible. What about being bold and painting the whole thing a chocolate brown color… and then rubbed bronze or copper hinges. I’m ALL about breathing new life into old furniture! I’ve even seen old pieces like that, where the person cut out just the right vintage paper flower or even a simple leaf border and decoupaged it onto the door for a very pretty effect or old maps inside the door?…. that would rock! ps. those books are awesome! and the salamanders too. We had garage clean out day on Sat as well. Feels good, right? I love your books — Kristen and I like to Watch Anne of Green Gables and Avonlea! I also like your cabinet — I’m sure you will find something very creative to do with it! Your posts are always so fun! 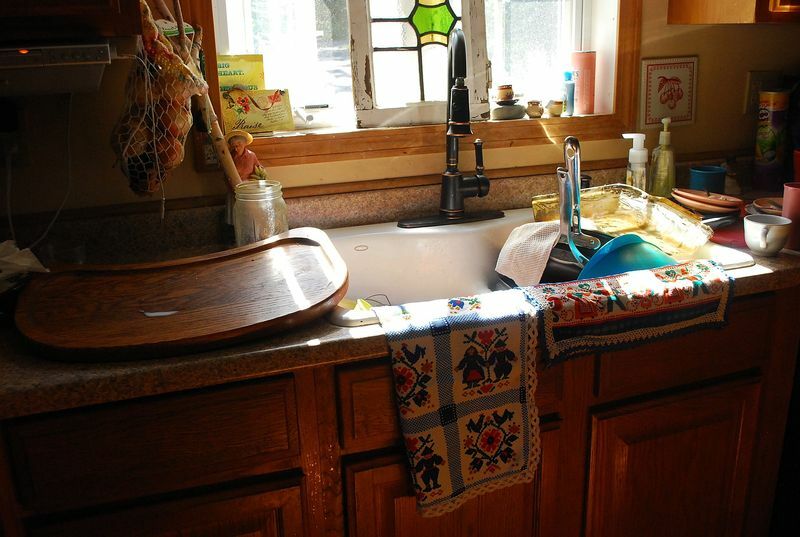 Hey Shan, love the post as usual… perhaps for now until you come up with the perfect idea for the cabinet you should just put one of your pretty tablecloths or a piece of vintage fabric over it so it comes to the middle of the cabinet as a triangle? it would hide some of it and it would still be functional??? i was going to say my favorite part of this post was the ‘ i love my life’ line ….. but its all so good : )such a sweet spot your blog is!! Still thinking about the cabinet. I like the idea of painting it a different color. I always like a surprise on the inside…like a different color or perhaps vintage book/hymnbook pages on the back wall. Of course…I already mentioned the new hardware before. I think I may be on the hunt for new hardware on that dresser I was painting last week. I was putting it back together this morning and noticed the original pulls were wearing thin. Good excuse for me to go on the hunt for replacements!!! 😛 w00t!